later named Isla de Santa Anastasia. 1625 French and English zones of occupation. 23 Jul 1665 - 1668 English occupation. Jun 1672 - 1682 English occupation. Apr 1689 - Jul 1690 French occupation (Saint-Eustache). Jul 1690 - 1696 English occupation (Saint Eustace). 1709 French filibusters briefly capture the island. 3 Feb 1781 - 26 Nov 1781 British occupation. 26 Nov 1781 - 7 Feb 1784 French occupation. 1795 - 1801 French occupation. 1801 - 1802 British occupation. 9 Jul 1810 Annexed along with Holland by France (not effected). 20 Feb 1810 - 1816 British occupation. Netherlands Antilles, see under Curaçao). 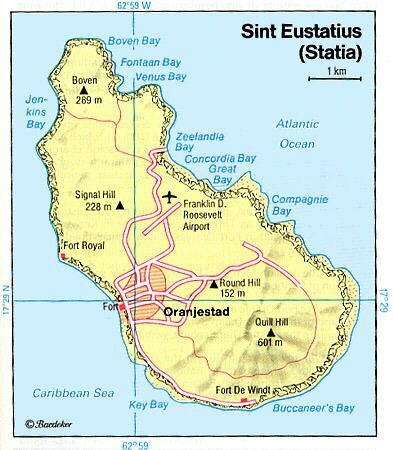 1919 - 1 Apr 1983 Sint Eustatius subordinated to Sint Maarten. low turnout invalidates the result). 7 Feb 2018 - Direct rule by the Netherlands. 1802 - 1809 Albert van Heyningen, Jr.